Like the millions of other Americans, the founders of the Maine Pet Expos are major animal lovers. Linda grew up on a farm with all the usual animals (cats, dogs, cows, pigs, chickens and a horse); as an adult, she always lived with a variety of cats and dogs (and a few white rats), all of them animals she & her daughter rescued in some fashion or another. In his previous life, John owned a farm for 30 years, where he raised kids and animals, which included assorted poultry, rabbits, cats – and lots of dogs (at one point, there were 8, most of them dachshunds). Nowadays, John and Linda live a little more quietly with Mr. Budro (Buddy) a senior wirehaired dachshund, and Rudi Roo, a schnoxie (mini schnauzer/dachshund cross) who comes by a bad case of “Terrier Greeting Disorder” rather naturally. Would like more info for your November show in south Portland. We don’t have the schedule done yet, and are not sure exactly what the dates will be. We believe the show will be held at the National Guard Armory in Portland. If you’d like to be on our email list, you can text 22828 and enter mainepetexpos, or if you prefer, I think I have your email address and can add you. 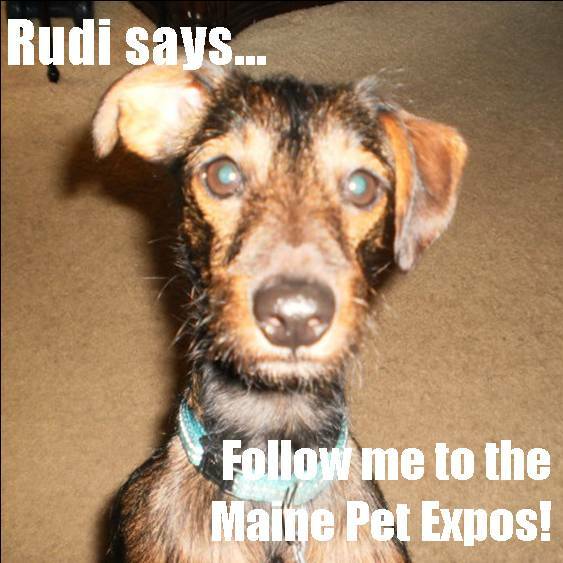 You can also Like our Facebook page and/or connect with our Twitter account (mainepetexpos). Unfortunately, our website is being completely rebuilt… it’s slow going since I’ve been out straight with work.